Things have been getting pretty heated on the Illinois political beat lately, but as it turns out, it’s nothing compared to the fisticuffs of nearly two decades ago. I want us to look back at a time in Chicago’s history when aldermen were punching each other in the face. It was a mild summer night in June of 1997. Families and political insiders cheered from all sides of the boxing ring at the South Side Cultural Center. In opposing corners of the ring (you knew that was coming): Chicago aldermen with their reputations and faces on the line. If not for the few videos and news photos that are still around, it might be hard to believe this actually happened. One newsreel features a sweating and panting Ald. Michael Zalewski, who was pulled in front of the camera as soon as he stepped out of the ring. It was a boxing match with a name as big as the egos on the roster: The Roar by the Shore. The event was the brainchild of alderman and former boxer Walter Burnett Jr. Whether that’s true for everybody is up for debate, but when the Chicago Park District boxing program needed some cash, Burnett instantly thought throwing his colleagues in the ring would make for the perfect fundraiser. As it turns out, it couldn’t have been a bigger hit at City Hall. Burnett remembers that even old-school guys like Ald. Bernie Stone and Ald. Burt Natarus, who weren’t ever really going to step foot in the ring, were apparently talking smack. The roster included 10 guys from Springfield to City Hall and two women - one alderman and one park district employee. There was even one journalist, WGN anchor Larry Potash, who is remembered as a “killer” in the ring. John Kass was the Chicago Tribune City Hall reporter at the time, and says he may have nudged Burnett a bit to put the event together. Who would have thought that those same politicians would put themselves out there in the ring? Apparently the decision didn’t come easily for everyone. Solis was so concerned about being embarrassed he wouldn’t even let his wife and daughters come to watch. This was clearly more than just any old fundraiser for him and other fighters—winning really mattered. Solis says he went into his match with Zalewski with a game plan. “When I was in high school I used to take karate. So I said you know I’m gonna just take hits, and if I get an opening I’m gonna use in karate what you call a straight punch. And I did that - and it worked perfectly, he fell down,” Solis said. Zalewski, however, remembers it a bit differently. “I had bought a brand new pair of gym shoes for the event, and they weren’t really the right size, so when I fell, people thought I was knocked down, but actually I just tripped,” Zalewski said. Solis eventually won the bout. The event ended up all over television, and on the front page of the newspaper. But even after all that, this would be the one and only time the city ever heard the so-called Roar by the Shore. “The next day when everyone was in pain, and their wives had to massage ‘em and put Bengay on ‘em and all that stuff, couple of guys were like ‘my wife (is) mad at you! For getting me to do this!’” Burnett said. I figured this story was appealing to me because I cover these guys all the time. But turns out, many Chicagoans I talked with want to see Roar by the Shore Round 2. Fred Smith was taking a cigarette break by Daley Plaza, and he told me a boxing match would be a welcome break in the performance that Chicago politics has become. “I want to see the real person, because that’s what people relate to. I say you’d get the sweat, the grit, the blood, the scratches, all of that stuff. That’s what Chicago people are all about,” Smith said. Mary Curry was setting up an event near City Hall. “The difference between athletics and politics is you can’t shim sham a winner, you’re either the fastest, or the strongest or you can throw the ball the farthest. You can’t lie about that, that’s the real deal,” Curry said. 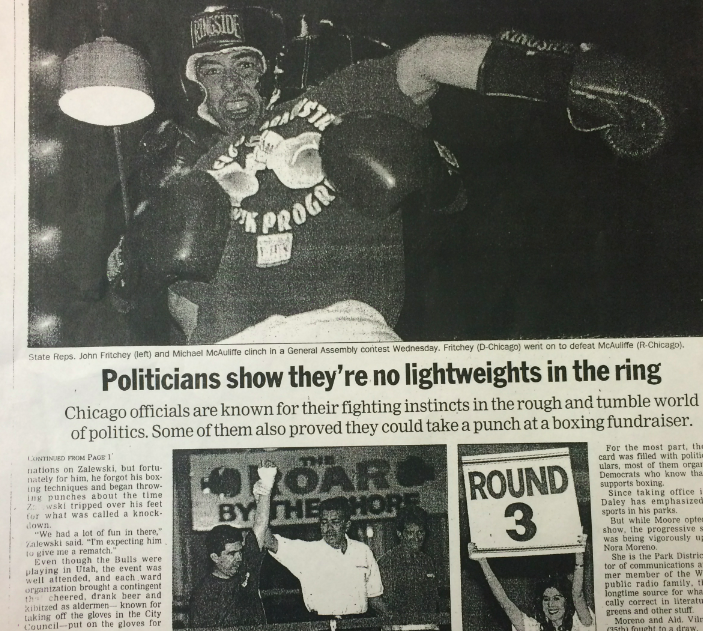 As for our boxing aldermen, they said they’re not against a rematch, but it being nearly 20 years later and all, they’d prefer to leave the gloves to younger aldermen. Burnett he said it might actually be good for politics. “There’s a funny thing after you fight someone. It brings you closer to each other,” he said. A lot of people I talked to, both politicians and civilians, say a boxing match might be a good option for Illinois Gov. Bruce Rauner and Illinois House Speaker Michael Madigan as they attempt to work through the state budget. Lauren Chooljian is WBEZ’s city politics reporter. Follow her @laurenchooljian.